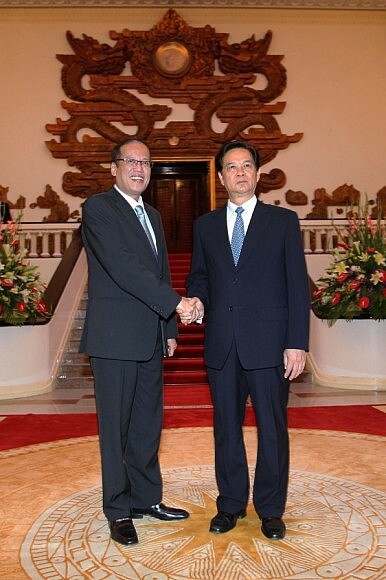 Philippine President Benigno Aquino II meets Vietnamese Prime Minister Nguyen Tan Dung. Officials say the pact could be finalized soon. The Philippines and Vietnam have agreed to ink a strategic partnership agreement by the end of the year to bolster bilateral ties, officials from both countries have said. According to Agence-France Presse, Philippine Foreign Secretary Albert del Rosario said that the deal could be signed on the sidelines of the Asia Pacific Economic Cooperation (APEC) leaders’ summit in November which will be held in Manila. The idea of a strategic partnership between the two countries is not new. It dates back to May 2014, when Philippine President Benigno S. Aquino III and Prime Minister Nguyen Tan Dung began publicly expressing their desire to move forward with a proposal to elevate ties to that level. Since then, the two countries have been exploring how to make this a reality. Aquino and his Vietnamese counterpart Truong Tan Sang agreed to convene a Joint Working Committee to make progress towards the partnership, and both parties have been working on a draft of the joint statement for a while now. A strategic partnership between Manila and Hanoi would seem to make sense on a number of levels. In addition to the often-cited convergence of views on the South China Sea, where both countries have been working hard to counter China’s growing assertiveness, both countries are also looking to collaborate more in maritime affairs more generally as well as strengthening the Association of Southeast Asian Nations (ASEAN) and boosting their economic partnership (See: “Challenged By China, ASEAN States Seek Common Response”). The deal, once concluded, would make Vietnam the Philippines’ second strategic partner; the other is Japan, a relationship which has seen an uptick especially in the defense realm (See: “Japan, Philippines Strengthen Strategic Partnership”). The Philippines also has a formal alliance with the United States that has gotten a boost over the past few years, particularly with the inking of the Enhanced Defense Cooperation Agreement (EDCA) in 2014 (See: “What’s Next for US-Philippine Military Ties”). The end of 2015 target seems plausible given the progress both sides have made thus far, including the work on the draft joint statement – parts of which had been leaked earlier this year. That being said, other such deadlines have come and gone before. Vietnam had reportedly initially wanted the signing to occur in April this year around the time of the ASEAN summit in Kuala Lumpur, and it has previously been thought that it would then occur around May or June. Tokyo and Manila give their close relationship a further boost. Japan-Philippines Defense Cooperation in Focus with Ministerial MeetingVietnam, Philippines Still Mulling South China Sea Joint PatrolsJapan’s Emperor to Make Historic Philippines VisitJapan, Philippines to Agree New Military Deal on APEC SidelinesWhat’s Next for Japan-Philippines Defense Ties?